THIS LISTING HAS 4 BASCAL BOWLS! PERFECT FOR ICE CREAM OR COLD CEREAL, BOWLS MEASURE 5 ¾” DIAMETER, 2” TALL. LOVELY COLORS – THERE’S A LIGHT BLUE, GOLD, RED, AND A BRIGHT BLUE. ALL ARE MARKED BASCAL AND ARE IN EXCELLENT CONDITION WITH VERY MINOR “USE” EVIDENCE. SUPER ITEMS! WELL, WELL, I LEARN SOMETHING EVERYDAY! I HAVE ALWAYS CALLED THIS DESIGN “DUCK IN FLIGHT” – PER BOX, THE CORRECT NAME IS “DUCK-N-TAILS”. 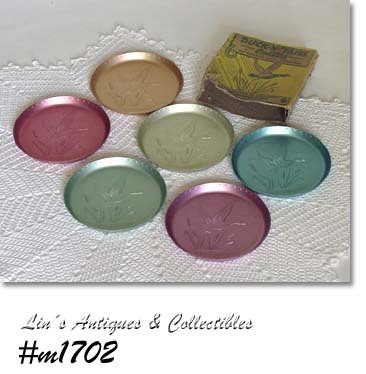 THESE EXCELLENT CONDITION COASTERS ARE IN BEAUTIFUL PASTEL COLORS AND THERE ARE 6 IN BOX. I PURCHASED THESE AT AN OUTDOOR ANTIQUE SALE/SHOW AND, OF COURSE, IT RAINED. THE BOX GOT WET AND THE END FLAPS FELL OFF AND ARE MISSING BUT IS STILL A NEAT “KEEPABLE”. VERY NICE ALUMINUM MEASURING SPOONS IN A LIGHT PINK COLOR! IN VERY GOOD CONDITION WITH MINOR USE EVIDENCE AND THE TABLESPOON HAS A SLIGHT BEND IN THE HANDLE (PROBABLY CAUGHT IN A DRAWER!). THE TABLESPOON HAS HONG KONG ON BACK, NONE OF THE OTHERS ARE MARKED. WOW – WHAT AN EYE CATCHER! 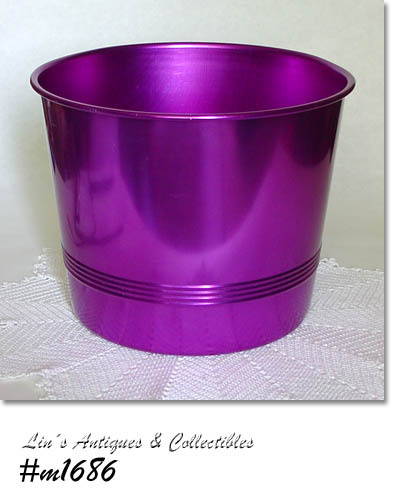 THIS IS A LARGE ALUMINUM ICE BUCKET – MEASURES 8” TALL, 10 1/8” DIAMETER – AND IS A BEAUTIFUL FUCHSIA COLOR. MINOR USE EVIDENCE – A FEW DINGS AND SCRATCHES – NOT DETRIMENTAL TO THIS DIFFICULT TO FIND ALUMINUM ITEM! BEAUTIFUL COLORS ON THESE BASCAL TUMBLERS – THERE’S A DARK GREEN, A RED-ORANGE, A DARK GOLD, SILVER, LIGHT PINK, AND A BLUE. ALL ARE MARKED BASCAL AND MEASURE 4 3/8” TALL. EXCELLENT CONDITION WITH MINOR RUBS, ETC THAT APPEAR TO HAVE OCCURRED DURING STORAGE INSTEAD OF FROM “USE”. VERY, VERY NICE ITEMS! SUPER NICE UNMARKED ALUMINUM LISTING! 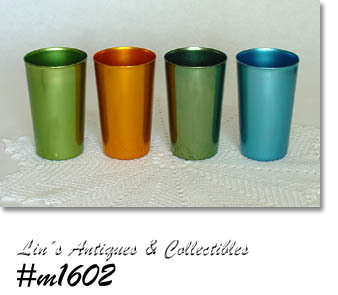 THERE ARE 8 COLORFUL TUMBLERS – GREEN, ORANGE-RED, BRIGHT GOLD, SOFT GOLD, YELLOW, FUCHSIA, DARK BLUE, AND A SHADE LIGHTER BLUE – IN A VERY NICE BLACK METAL HOLDER. GLASSES MEASURE 5 ¼” TALL AND APPEAR NEW AND UNUSED – ANY MARKS OCCURRED DURING STORAGE, NOT USE! LOVELY ITEMS TO USE OR DISPLAY. ANOTHER OUTSTANDING BASCAL LISTING -- 6 CEREAL BOWLS (THE SMALLER SIZE, MEASURE 1 5/8” TALL, 5 ¼” DIAMETER) AND ARE MARKED BASCAL! COLORS ARE EXCEPTIONAL – BRIGHT BLUE, DARK GREEN, LIGHT GREEN, RED, AND THERE ARE 2 IN THE DIFFICULT TO FIND PINK COLOR! THESE BOWLS LOOK NEW – ANY MARKS OCCURRED DURING STORAGE (STACKING). NEAT RETRO ADVERTISING PREMIUM GIVEN BY MARATHON STATIONS! SILVER COLOR ALUMINUM ICE TONGS, MEASURE 8 ¾” LONG, HAS “NEW MARATHON GASOLINE, BEST IN THE LONG RUN”, AND HAS THE “RUNNING MAN” LOGO. GREAT CONDITION!! THIS LISTING HAS 4 BASCAL TUMBLERS! THERE ARE 2 SILVER COLOR, 1 LIGHT BLUE, AND ONE LIGHT COPPER/GOLD COLOR – EACH MARKED BASCAL. MEASURE 4 ½” TALL AND ARE IN WONDERFUL CONDITION WITH MINOR “USE” EVIDENCE (MOSTLY FROM STACKING TOGETHER). NICE ITEMS, NICELY PRICED! EXCELLENT CONDITION BUN WARMER! MADE BY WEST BEND AND IS IN THE MORE DIFFICULT TO FIND AVOCADO GREEN COLOR. GREAT ITEM!! THIS IS A SUPER BREADBOX! 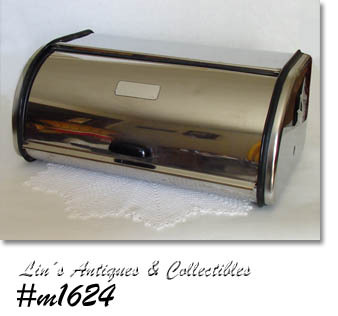 IT’S SILVER COLOR WITH BLACK HANDLE, HAS “ROLL TOP” TYPE DOOR, MEASURES 16 ½” LONG, 10 ¼” WIDE, 7” TALL AND IS IN VERY GOOD CONDITION. HAS A FEW MINOR SCRATCHES, ETC. ASSOCIATED WITH USE AND DOOR HAS A SMALL INDENTATION THAT PROBABLY OCCURRED DURING STORAGE. DOOR HAS A SILVER COLOR LABEL THAT PROBABLY HAD THE WORD “BREAD” ON IT BUT HAS SINCE WASHED OFF. VERY NICE ITEM THAT IS BOTH USEFUL AND ATTRACTIVE – COMPLIMENTS MOST ALUMINUM CANISTER SETS! VERY NICE SPICE SET WITH RACK MADE BY KROMEX! 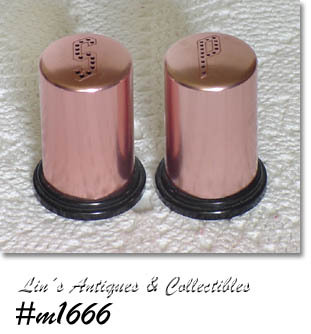 THERE ARE 8 SPICE CONTAINERS (ALL SPICE, CAYENNE, CINNAMON, CLOVES, GINGER, MUSTARD, NUTMEG, AND PAPRIKA), MEASURE 3 5/8” TALL, HAVE SHAKER INSERTS, AND ARE SILVER COLOR WITH LIGHT COPPER COLOR LIDS. THE SILVER COLOR RACK MEASURES 8 ½” LONG, 4 ½” WIDE, AND 4 ¼” TALL (AT TALLEST). IT HAS 2 HOLES FOR HANGING AND IS ALSO FREE STANDING. HAS THE WORD “SPICES” ON FRONT. SET IS IN VERY GOOD CONDITION WITH MINOR “USE” EVIDENCE – DINGS, ETC. DIFFICULT TO FIND KROMEX ITEM! BEAUTIFUL SET OF 4 BASCAL TUMBLERS! THERE’S A PUMPKIN COLOR, SPRING GREEN, BLUE, AND GREEN – ALL MARKED BASCAL. MEASURE 4 ½” TALL AND ARE IN WONDERFUL CONDITION. MINOR INTERIOR WATER “SPOTTING” ON THE GREEN ONE AND THE BLUE ONE HAS A SMALL INDENT AT RIM – I’M CERTAIN IT OCCURRED DURING STORAGE AND IS NOT DETRIMENTAL. GLASSES LOOK NEW! 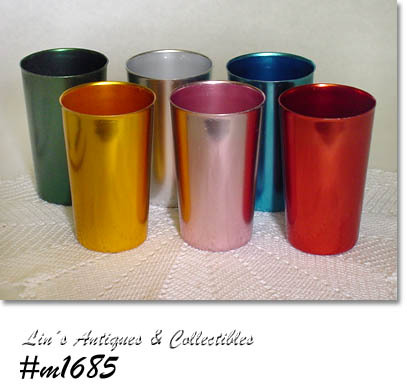 BEAUTIFUL ALUMINUM TUMBLERS! THERE ARE 8 IN THIS LISTING, MEASURE 4 ½” TALL, AND ARE UNMARKED. THE COLORS ARE EXTRA NICE: RED, PURPLE, LIGHT GOLD, SPRING GREEN, TEAL/BLUE, SILVER, DARK GREEN, AND A PUMPKIN COLOR. IN EXCELLENT CONDITION – THE GOLD ONE HAS WHAT APPEARS TO BE WATER/SOAP SPOTTING BUT I’M NOT CERTAIN – IT COULD BE PRODUCTION BUT IS NOT DETRIMENTAL. VERY NICE! VERY NICE ALUMINUM LISTING! THERE ARE 8 GOLD COLOR GLASSES, MEASURE 5 1/8" TALL, AND ARE IN WONDERFUL CONDITION WITH VERY MINOR "USE" EVIDENCE. GLASSES DO NOT HAVE MANUFACTURER'S MARK. PRETTY SET! VERY PRETTY, COLORFUL ALUMINUM ICED TEA SPOONS! 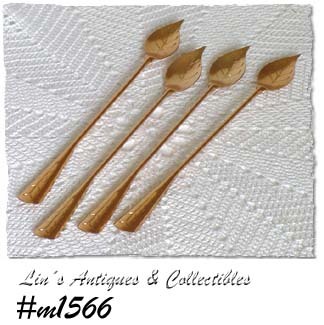 THERE ARE 4 TALLSTIRS IN THIS LISTING AND ALL ARE SHINY GOLD COLOR. MEASURE 7 3/4" LONG (END TO END), BOWL IS SHAPED LIKE A LEAF AND HAS PRETTY "STEM" TYPE DESIGN WITH SAME STEM DESIGN ON HANDLE. NICE! NEAT SILVER COLOR ALUMINUM SHAKER! 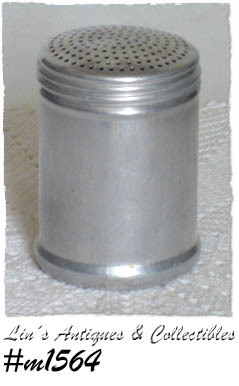 MEASURES 3 5/8" TALL, LID HAS LOTS OF SHAKER HOLES TO DISPENSE SUGAR. GREAT SHAPE, MINOR "USE" EVIDENCE. 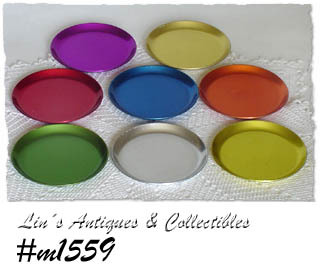 THESE COASTERS ARE SO COLORFUL AND THEY COORDINATE BEAUTIFULLY WITH SEVERAL OF THE ALUMINUM TUMBLER SETS WE HAVE LISTED! THERE'S A PERSIMMON COLOR, BLUE, RED, BRIGHT YELLOW, SILVER, GREEN, LIGHT YELLOW, AND A FUCHSIA COLOR. IN VERY GOOD CONDITION WITH MINOR "USE" EVIDENCE. NICE. 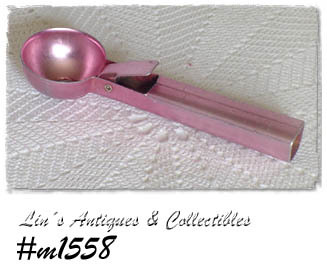 NICE ALUMINUM ITEM -- AN ICE CREAM SERVER (SPOON) IN A PRETTY PINK COLOR! SPOON HAS BEEN MUCH USED AND HAS LIGHT SCRATCHES AND SOME COLOR WEAR FROM DRAWER STORAGE. STILL A VERY NICE AND USABLE ADDITION TO A COLORED ALUMINUM COLLECTION!